…Now you understand just why my head’s not bowed. I don’t shout or jump about or have to talk real loud. When you see me passing it ought to make you proud… Cause I’m a woman phenomenally…Phenomenal woman – That’s me (excerpt from Maya Angelou’s Phenomenal Woman published in “And Still I Rise”, 1978). Hallie Quinn Brown was an elocutionist, educator, school administrator, and activist who raised her voice for social justice. She was an early example of a scholar-activist in our field. Hallie was born in Pittsburgh, Pennsylvania to former slaves who were released from unwaged physical labor by their captors, and acquired the means to purchase their freedom. Hallie’s maternal grandfather was her mother’s captor, and her paternal grandmother was her father’s owner. Hallie’s parents became part of the Underground Railroad, a period of time that would shape Hallie’s view of the world and her fortitude for being a change agent within it. Hallie was born around the time that the U. S. enacted the Fugitive Slave Act explaining a massive out-migration of Blacks from the U. S. into Canada. Hallie’s family moved to Chatham, Ontario (Canada) a few years after she was born. Brown, the educator, held various teaching positions in plantation schools in Mississippi, and South Carolina during the 1870s, and public schools in Dayton, Ohio in the late 1880s. In the 1880s, Hallie Brown became a public speaker, traveling across the US speaking against racism, against repression, for women’s suffrage and to campaign for Warren Harding. She did this between 1880 and 1885. She also traveled extensively in Europe speaking out for human rights for Blacks and for women’s right to vote. Biographers (such as Berce, Johnson, Keenan, & Williams, 2000; Curtright, 2004; Lyman, 1999; Strom, 2000) report that Hallie Q. Brown, although versed in what is considered standard American English, frequently used African American Vernacular English (AAVE) to pay tribute to the language of people of African descent living in the U. S., as well as to exemplify her ideas. 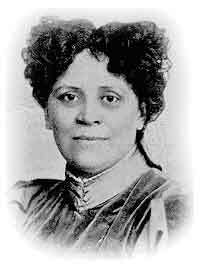 In 1893, Hallie, the activist, developed and organized the Colored Women’s League in Washington, DC, which was the first organization to gather Black women together for the purpose of promoting the interest of Blacks in the U. S. (Ham, 2005). Three years later, in 1896, this organization joined with the National federation of Afro-American Women to form the National Association of Colored Women, which eventually included among its members and officers personalities such as Ida B. Wells, Mary Church Terrell, and Mary McLeod Bethune (Ham, 2005). In the early 1900s after many years of teaching and organizing groups against racism, she took a position in the Department of Speech at Wilberforce University, a private coeducational liberal arts college founded by and geared to African Americans. There she taught elocution. Hallie Q. Brown continued to work for social justice in various ways until the end of her life – she passed away in 1949, and is buried in Wilberforce, Ohio where she spent so much of her time teaching elocution. Brown, Hallie Quinn (ND) As the mantle falls . Unpublished autobiography. Brown, Hallie Quinn (1880). Bits and odds--A choice selection of recitations for school, lyceum, and parlor entertainments. Xenia OH: Chew Press. Brown, Hallie Quinn (1907) Mashile: The story of an African who had a vision . Xenia OH: Homewood Cottage. Brown, Hallie Quinn (1910) Elocution and physical culture: Training for students, teachers, readers, public speakers. Wilberforce OH: Homewood Cottage. Brown, Hallie Quinn Not gifts but opportunity. In McFarlin (1975) 173-81 (see reference below). Brown, Hallie Quinn (1924) Lizette, the beautiful: A true story of slavery. Gospel Herald and Saturday Evening Call, 22 , #43, p. 1-3. Brown, Hallie Quinn (1925) Our women: Past, present and future. Xenia, OH: Eckerle Printing Co.
Brown, Hallie Quinn (1925/1997) Tales my father told and other stories . Wilberforce, OH: Eckerle Printing Co. Reprinted in Robiin Kilson (Ed.). Women builders. NY: G. K. Hall & Co.
Brown, Hallie Quinn (1926) Homespun heroines and other women of distinction. Xenia OH: Aldine Publishing Co.
Brown, Hallie Quinn (1937) Pen pictures of pioneers of Wilberforce . Wilberforce, OH: Aldine Publishing Co. Reprinted in Robiin Kilson (Ed.). Women builders. NY: G. K. Hall & Co.
Berce, A., Johnson, S., Keenan, C., & Williams, T. L. (2000). Hallie Quinn Brown: 1845-1849 . Retrieved in March 2006 from http://voices.cla.umn.edu/vg/Bios/entries/brown_hallie_quinn.html. Curtright, L. (2004). Updated pages for Hallie Quinn Brown: 1845-1849 . Retrieved in March 2006 from http://voices.cla.umn.edu/vg/Bios/entries/brown_hallie_quinn.html. Davis, Elizabeth Lindsay (Ed.) (1933/1996) Lifting as they climb . NY: G. K. Hall. Donawerth, Jane, ed. (2002) Rhetorical theory by women before 1900: An anthology . Lanham, Md. : Rowman & Littlefield. Jackson, R. & Brown, S. (2006). Black pioneers in communication research. Sage Publications, Inc. http://www.sagepub.co.uk/upm-data/11830_Chapter3.pdf. Kates, S. (2001). Activist rhetorics and American higher education: 1885-1937 . Carbondale, ILL: Southern Illinois Press. Lyman, D. (1999). Great African-American women . Middle Village, NY: Jonathan David Publisher, Inc.
McFarlin, Anjanette Sophie (1980) Hallie Quinn Brown: Black woman elocutionist, Southern Speech Communication Journal , 46, (Fall 1980): 72-82. McFarlin, Annjenette Sophie (1975) Hallie Quinn Brown: Black woman elocutionist. Unpublished Dissertation, Washington State University. Available on Digital Dissertations database. Spencer Maor, Fay (2004) Lifting word by word: Ideologies of literacy, education and feminism in the rhetoric of two nineteenth century African-American women. Unpublished Dissertation. University of Illinois at Urbana-Champaign. Stetson, Erlene (1983) Black feminism in Indiana, 1893-1933. Phylon 64, no. 4 292-98. Wright, A. Augustus (Ed.) (1906) Who's Who in the Lyceum. 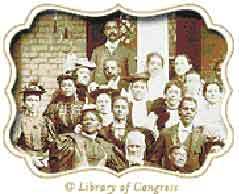 Encyclopedia Britannica: Schomburg African American Writers of the 19th Century http://www.britannica.com.